If you are attending the show, come by and have a chat! 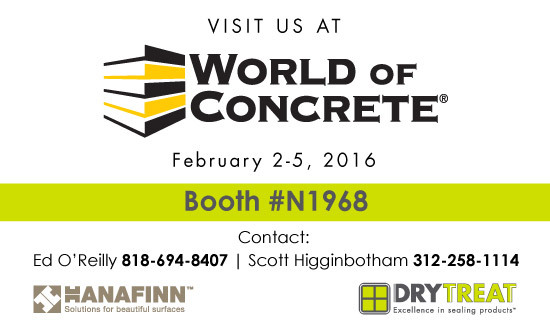 We will be showcasing our 2 latest products, the HANAFINN Paver-Finisha™ and the HANAFINN Eff-Erayza™. Paver-Finisha™ provides a new level of enhancement and protection for concrete pavers. It is a new technology that replaces traditional coatings which fade, yellow, whiten, crack and peel. Better Protection - Paver-Finisha™ is not a coating. Paver-Finisha™ creates a layer of deep color enhancement and protection from water and oil-based stains, plus a deeper layer of water repellence that protects against efflorescence. Deeper Enhancement - An intense color enrichment that can't be achieved by regular enhancers or topical coatings. Simple Application - When the Paver-Finisha™ wears, no stripping is required, just clean and re-coat. Longer Lasting - Paver-Finisha is not a coating. Traditional coatings fade, yellow / whiten, crack and peel. Paver-Finisha™ is UV stable and lasts approximately 5 years. Eff-Erayza™ is a powerful efflorescence, rust stain and mortar mess remover, but it doesn't release toxic, dangerous fumes and it won't burn you. Eff-Erayza™ is the replacement for for traditional muriatic and phosphoric acids. Non-Fuming - Eff-Erayza™ doesn't release toxic, dangerous fumes and temporary skin exposure does not cause burns. Powerful Cleaner - Eff-Erayza™ is just as powerful as muriatic acid for removing efflorescence, rust stains, grout haze and mortar mess. Plus, the longer dwell time means it cleans more deeply and efficiently. Easier to Use - Eff-Erayza™ reacts slower and is much easier to control. Super Concentrate - 1 quart of Eff-Erayza makes approximately 4 gallons of powerful efflorescence remover.